All of our windows are DMV/DOT approved safety glass. Made from original factory patterns. All of our products ship fully insured. The tint is made into the glass, it is not a cheap film or spray on tint. Contact us for installation tips and shipping cost. Q: Can we get glass shipped to a foreign country? A: Most of our items can ship internationally. Please see the International Orders page for more information. Q: How do I get installation help? A: Give us a call on our toll free number 1-800-624-2130 stateside or from Canada call 1-541-925-3260 and we will be glad to answer any installation questions you should have. 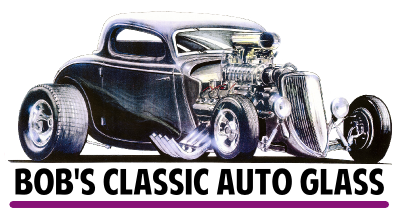 We have been installing glass in classic cars and trucks since 1984 and can get you going in the right direction. There is no such thing as a dumb question so feel free to give us a call. A: All Bob's Classic Auto Glass shipments are carefully packaged and fully insured. We have been shipping auto glass for 25 plus years and have developed a very good system of boxing our windows so that we rarely have any issues at all. Our smaller glass kits ship by way of UPS and we ask that you inspect your shipment upon arrival. If there is any breakage problems at all contact us immediately and we will file a claim with UPS and get a replacement window out for you at no cost whatsoever. Please inspect glass within 48 hours of arrival so that UPS will honor the insurance. All of our larger glass kits ship by way of truck freight. These shipments are packaged in a palletized crate, very well packed and also fully insured. Due to the size of the crates we prefer to ship to a business address which is less expensive than to a home. On any big rig truck shipments, it is required that you inspect the glass upon arrival before the driver leaves. Do not sign the delivery manifest until you have inspected the glass because once you sign that means you are stating you have received the shipment without any damage and the insurance is then null and void. So please inspect the shipment upon arrival before signing the paperwork. If there should be damage to any of the glass in the shipment, have the driver make note of the damage on the manifest then go ahead and sign and accept the remaining undamaged windows. Give us a call on our toll free number 1-800-624-2130 stateside or from Canada at 1-541-925-3260 and we can then get your replacement window resent. Q: Will your windows be the same shape as my original glass? A: Yes. All of our windows are made from original factory templates and have been installed in hundreds of previous customers vehicles. As long as you let us know the year, make and model of your vehicle, there should be no problems. Occasionally mistakes are made and if that should ever happen, please give us a call and we will do our best to remedy the issue.